Our German client from the finance sector has chosen DBPLUS Data Replicator™ in subscription version to facilitate an annual migration of its databases to the newest version. These days database migration to new database environment versions is possible without having to stop business processes operating on the system. The entirety of data replication from the old DB to the new one, testing, and modification of processes takes place simultaneously with normally functioning customer service operations just like any other day. The final switchover to the new database version takes place during the nightime data processing window. In the morning, when the IT system starts up in the new database, the replication system reverses direction and new data are replication from the new to the old database, so that if it is necessary to return to the old system there will be minimal loss of new transactions on a given day. One of the solutions which we use is replication of business data in real time. One example is the use of data replication between a transaction system and reporting system. The data from the transaction system are replicated to the reporting system in real time. Because the data is taken from log files, the operation is executed without load on the source database, and users of the transaction system do not feel any difference in how the application operates. Data in the reporting system are exactly the same as the current data in the transaction system, so reports are made with up-to-date data. It is not necessary to enter data into the reporting system in late evening or nighttime hours. DBPLUS Data Replicator™ – on-line reporting of current data. Facilitates reporting, migration, updates, data warehousing, and Business Intelligence systems. For when the data uploaded to data warehouses are not sufficient for users, and direct reporting from the transaction system would cause data loss. 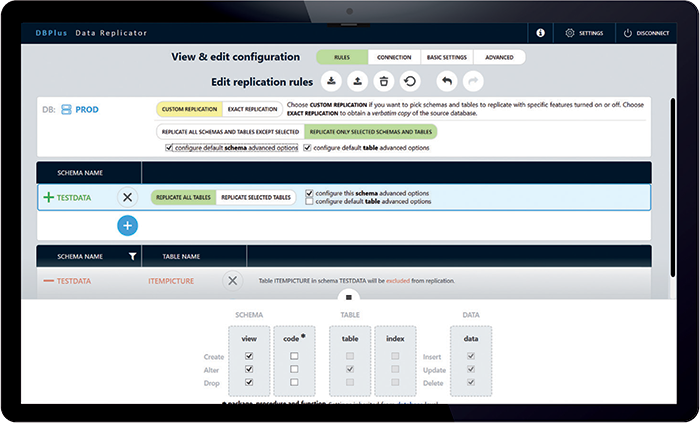 Allows replication to be conducted without the need to add extra load to the source database. Thanks to reporting from the on-line replica, reports are based on current data in real time, without impacting the work speed of transaction system users.